A tree brought to life with my memories of people, places and times. I usually buy my tree the week before Christmas and leave it out on the balcony until I have time to start decorating it. This year it was bought and brought straight indoors and I spent several evenings during the last week of Advent hanging up the decorations that have been stored away all year. I savour this time as each and every treasure that I bring out of the box has a special meaning for me, either because of the place where I bought it or because of the person who gave it to me. The actual activity of doing the decorating holds the biggest memories of all. I always did this with my Mum. In my childhood with my sister too, but later for many years, when Sis had a home of her own, it was just me and Mum. 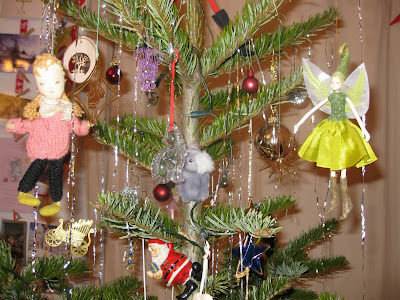 Mum and I decorated the tree together most years until I was no longer living in England. When I went to live in Hungary in 1989 I was thirty two years old, that’s a lot of years of hanging shared memories on a tree! It is only through writing this that I realise just why my Christmas tree decorating and its treasures are so important to me and why, even though I am living alone, I continue with the tradition. As we “worked” on the tree she told me stories about her own childhood Christmases and we talked about the people who had given us the toys that we were hanging on the green branches. We enjoyed the smell of fresh cut tree, we enjoyed the time together. Until I lived “abroad”, each Christmas as soon as I got home from wherever I was living Mum and I would go up into the box-room together and hunt out the ancient cracker boxes that we used for storage. Opening the boxes one by one we would re-discover the same old childhood decorations and packed up with them, the memories. It would always take us ages to hang them because, as I have said, we would talk about where each one came from and I would have hundreds of questions about the places or the people. All these memories, plus many more newer ones of my own, are now hanging on the tree beside me. I was so happy when, a couple of years before she died, my Mum gave me the ancient cracker boxes with their contents, memories and all. Now as I decorate my tree on my own, I really do savour every single minute. There are so many of my friends and friends of my Mum “hanging out” with me each Christmas. When they are all hanging, sparkling underneath the twinkling lametta, I enjoy many evenings sitting and reading, or blogging or painting beside it, now and then fiddling with the odd clown or creature who just refuses to look in the right direction. This year I bought myself a new treasure. 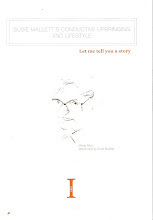 I found it in the bookshop in Johannis, the area of the city where I live. It was the day on the last weekend before Christmas when the streets were covered in snow that was glistening brilliant blue in minus fourteen Centigrade. I bought a glass snowman with a carrot nose and a Besen under his arm. It has found its place on my tree and each year as I take it out of the ancient boxes it will remind me of the lovely place where I now live, of the sudden coldness that arrived on that day and of the peaceful hours that I spent in the bookshop choosing presents. I have brought things home over the years from most of the countries that I have visited and from the English, Welsh, German and Hungarian cities that I have lived in too. There are decorations from Mexico and Guatamala, from North America and Canada, from Australia, New Zealand and of course from England. There are decorations sent from friends all over the world. 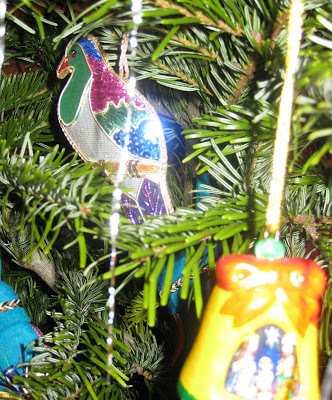 There are dolls on the tree, old and new, there are birds and stars and angels. There are Santas, made out of wood, out of metal and out of cloth, Santas playing music, riding sledges and even a rubber one standing on his head. 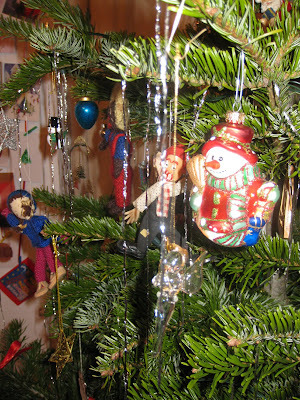 There are even the red “Conductive Education” Pedro boots hanging on my tree! I don’t usually do lists but I am going to do one now. Working from the frog angel at the top down to the reindeer on a peg at the bottom I am going to list some of my special memories. I will try to match them to the photos at the top. · The Frog Angel – a present from my Sis, who watched me since a tiny girl observe in wonder each frog that I ever met! 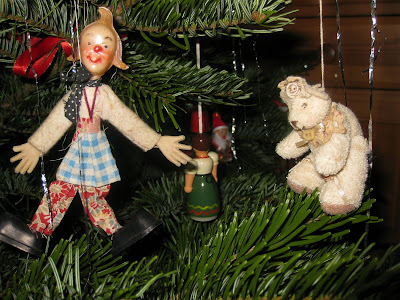 · The Skinny Santa that Mum bought us when we were young and what we decided was the best decoration that we had. He immediately replaced the old tatty fairy at the top. He takes second place these days to the frog angel. · There at the same height are the German frog-fairy and the New Zealand pixie, both arrived in the post three years ago from two very special friends. 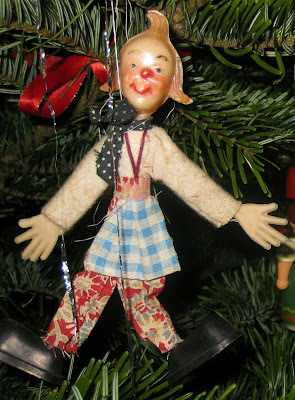 · Four clowns who are ancient (one has a foot missing) have been hanging around the middle of the tree for some fifty years now, as have the two plastic dollies, one red (belonging to Sis) and one green (mine). I have no idea who gave them to us but most probably they came from a lady-friend of my Grandma’s, who gave us many of the toys on the tree. · Of the same vintage are the colourful chocolate umbrellas complete with chocolate. The silver and gold umbrellas were a more recent present, from Mum. 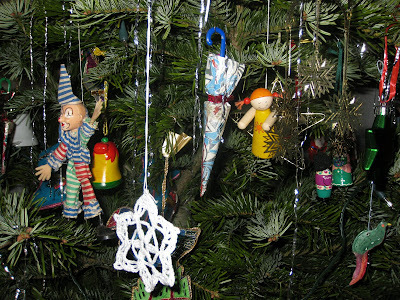 She sent them when I first had a tree in Germany, in 1993. They are also still complete with chocolate. My Sis and I were experts at not eating our chocolate figures and insisting that at Easter and Christmas they got packed away for next year. 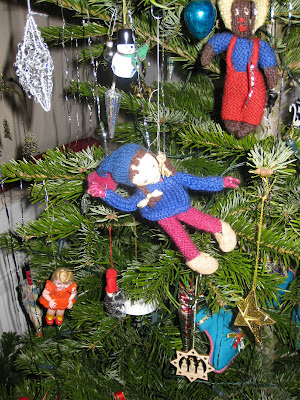 · There are two knitted dollies, the pink one belongs to Sis and the blue one to me. We always only hung up only our own toys and this year I phoned as always to tell her I would do it for her if that was OK! · There is only one knitted golly, made for me when I was a two year old by my Mum. My sister of course has kept hers too. It is different from mine only in that her golly is wearing trousers and not dungarees which I think is probably a reflection of the clothes that we each wore at the time! 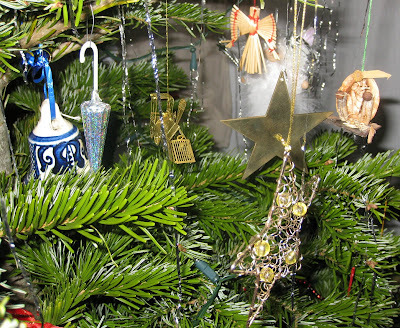 · Then there are the three Christmas bells, used to call the family when the Christkind has been to deliver the presents. These were not used for this purpose as in our family Santa climbs down the chimney in the middle of the night. These bells were presents from special people, one from Budapest and one from Pecs, each in different traditional ceramic styles. The third I was given in 1987 by the family I spent Christmas with in Adelaide. Seven years ago that lovely Australian cousin died so it holds extra special happy/sad memories for me. · Happy/sad memories are also woven into the white snowflake that hangs behind the tinsel, given to me by a younger colleague the Christmas before she died.
. 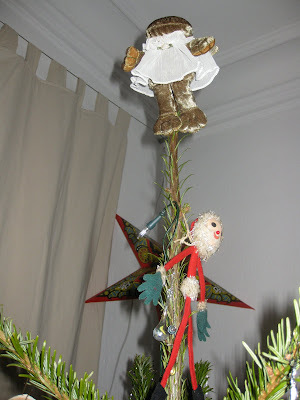 There is the fortieth-birthday tiny- teddy and the fiftieth-birthday wooden angel.
. The delicate stable scene in a walnut shell, with figures made from date stones and grains of wheat, has survived eighteen years unscathed since it was given to me on my third Christmas in Budapest. · The more robust but still very small Christmas scene reminds me of the Christmas of 1988 that I spent in Mexico and, as my gaze falls on to the handmade heart beside it, I recall the summer before, spent with friends in the Bahamas. · And of course there is a train, a brass one that reminds me always of my Dad, even though I bought it myself. Dad was a steam, and diesel and electric train-driver! 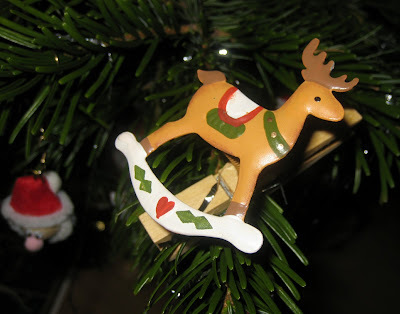 there is a peg with a reindeer to remind me of mum (she used pegs for everything but as far as I remember never on the tree). There are too many things there to list them all, many of the rest come from a few special friends who send me something each year. The rest of the treasures I have bought for myself on holiday, at markets and on special days in special places. I remember a story behind them all, each time they come out of their boxes. Santas from Hungary, a glass Santa from Prague, a glass cat from Atlanta, Georgia, glass angels that adorned a present one year, stars from the market in Nürnberg, a teddy made by my Auntie, another given as a special thank you by my Sis. There is even penny-farthing made by a friend from a scrap of wire that he found as we sat around a table on my thirty-fifth birthday, in a garden in Szentendre, Hungary! It is no wonder that it takes me so long to decorate my tree with so many people and places to think about. 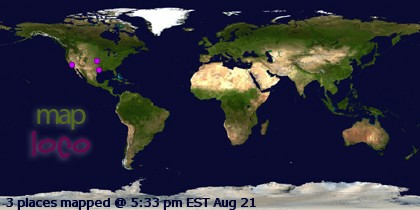 I am so lucky to have so many special friends and memories joining me each year from all over the world. And because my tree lives it also grows.